A backyard pool can be a lot of fun, but it does not come without some liability issues that homeowners should be aware of. Safety devices and additional insurance coverage can help lessen the financial risk associated with having a pool in your backyard. Homeowners are typically held liable for any injuries or deaths that occur as a result of a backyard pool and this is also generally true even if the person who is injured or drowns does so when accessing your pool without your permission. This means that if neighbors hope your fence and use your pool while you are away, or if a neighborhood child wanders into your backyard without your knowledge, you are liable if anything happens in the pool to cause harm. The fact that you are not aware of the pool being used does not absolve you of liability. Pool accidents are not limited to instances when the homeowner is not aware of the pool's usage. Drowning can occur swiftly and without other people noticing, as can near-drownings that require immediate medical attention. Pool owners may find themselves subject to costly lawsuits, which is why it is so important to have adequate insurance. This may include homeowners insurance in addition to extra liability insurance. Homeowners are wise to incorporate every safety precaution available with regards to their backyard pools. While these precautions do not absolve the homeowners from liability, they can decrease the risks associated with owning a backyard pool. While no safety precaution for pools can eliminate the associated risks, not putting safety precautions into place may be viewed as outright negligence. Make the pool inaccessible when you are not present. A gate with an alarm and a lock placed high is a good start, but a safety pool cover is another good step. The pool should have always have a capable and sober adult present when people are swimming or hanging around the pool. There should be no items stored in or near the pool that might entice a young child, such as inflatable toys. Basically, the point is to make the pool as inaccessible as possible when not in use and to also make sure that a responsible adult is always present when people are enjoying the pool. Other factors, such as having a telephone near the pool in case an ambulance needs to be summoned or placing a sign by the pool that warns swimmers that they should only swim at their own risk, may decrease risk but will not decrease liability. Adding safety features in and around your backyard pool may lower the total cost of your homeowners insurance, but do expect to pay extra for your policy with a pool. 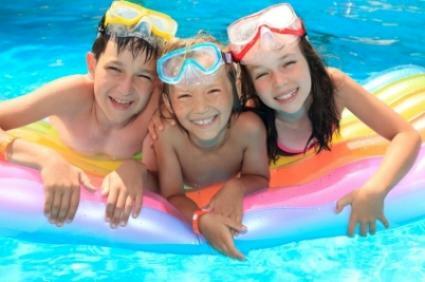 The insurance company may also require certain safety features before issuing a policy and insurance claims may be denied if appropriate pool safety features were not implemented. It is important to reveal to your homeowners insurance company that there is a pool in your backyard and to obtain appropriate coverage. Your existing homeowners insurance policy may not cover your pool. If it does cover the pool, it may not provide the type of coverage you truly need in the event of a lawsuit. Consider obtaining additional liability insurance or increasing the liability portion of your existing policy. While this may result in higher costs, most homeowners agree that the additional costs are absolutely worth it. Speak to your insurance provider about the type of insurance coverage you should maintain when you have a pool in your backyard.